Tonight I tried a recipt from the TV show Kinas mat (Chinas´s Food), which is sent on Swedish SVT1 with Peter Önnewall. Since it is advent and “Lussebullar” with saffron on the agenda it was tempting to try another saffron dish. So tonight I made Chinese sauted Cabbage with Saffron and Roasted Chestnuts." It was delicious. Both the taste and the color warmed right into the soul on this dark and cold december night. 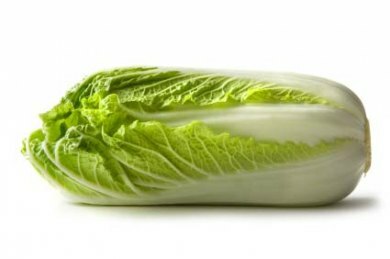 Choose the inner leaves of the Chinese cabbage. Cut them on the middle so the bit thicker bottom is parted from the thinner greener tops of the leaves. Put the thicker part of the leaves in the boiling water first and boil for 2 minutes. Put the thinner parts of the leaves in the boiling water and cook for another minute. Pour off the water and immediately put the leaves in cold water. Add salt, sugar and saffron to the chicken stock. Add the mix of cornstarch and water and stir.Add the Chinese cabbage, the spring onions and the chestnuts to the soup and heat all up. Serve! Ha ha, har inte tänkt på det faktisk, men prova denna, den var otroligt god och så nyttig!